I travel for work so I often seek the services of a taxi. There is a trend that is bothering me and I keep thinking it will change but it’s not. I am finding that most taxi cab drivers give me a hard time for using a credit card. (Rolling of the eyes, a sigh of unhappiness, asking me if I could pay in cash). Even though I have confirmed with the airline that the taxi cab driver takes a credit card and I have also confirmed with the driver before I get into the car, it still seems to be a problem. On my last trip the taxi driver that drove me to the airport even continued to express his annoyance with me once we got on the road by saying, “I really was expecting cash.” I just told him “Sorry, it’s all I have,” which was the truth. I did have two good (and rare) experiences with credit cards and taxis. These are actually the only two good experiences I can thinking of out of the ten years I have been travelling for work. One was at a recent trip to Las Vegas. Most taxis in Las Vegas have a machine in the back seat to swipe your card and it will calculate the tip and print out a receipt. All of this was done before the driver even got to my car door to help my out. I loved the convenience, that I didn’t have to do math to figure the tip, and it really wasn’t a big deal to the driver that I had a credit card. My second good experience was with another driver in Atlanta. He had a Square . He quickly swiped my card on his iPhone and had me sign my name with my figure. Super quick and super easy. 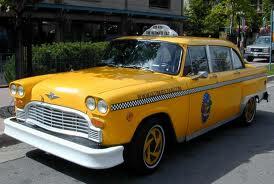 More taxi cab drivers should use the Square. It’s inexpensive and fast. I understand that the frustration of taking my credit card is because they have to pay a service charge, but I really wish they would accept my payment more happily. The next time a driver huffs and puffs at my credit card, I’m going to get out and ask for another driver….a more appreciative driver. Because truthfully, I usually tip more when I use my credit card.